Some of the most memorable scenes in movies have been aided by a strong cup of tea. Here are the ones that have captured our hearts and our imaginations, over the years. Mary Poppins (1964) takes tea time very seriously, and while there are several scenes that involve a pot of tea, the most hilarious is without a doubt, the one in which an entire tea service is performed while suspended mid-air. Mary Poppins’ propensity for juxtaposing the very proper with the absurd delivers the desired comic effect. Drinking tea, while discussing the weather, and passing around a jug of milk, while floating in the air is a scene that had both children and adults giggling. We can’t wait to see the teatime surprises that the 2018 adaptation of the book has in store for us. Every 00’s kid remembers the iconic scene in Princess Diaries (2001), where a particularly youthful Anne Hathaway, who plays Mia Thermopolis, a gangly, awkward teenager, discovers that she is in fact, the princess of a European state. The news is delivered by her grandmother, the Queen – played by the glorious Julie Andrews over a fancy tea held in a garden. Mia’s uncouth reaction to the news, while her grandmother daintily sips tea from expensive china, is forever seared into our brains. No fictional characters have as strong an association with elaborate, outrageous tea parties quite like Alice and her partners in crime, The Mad Hatter and the Cheshire Cat, do. The whimsical, quirky teapots that never seem to fall out of fashion are, in part, inspired by the tea party in Alice in Wonderland. The 2010 adaptation by Tim Burton, was particularly splendid and rich in detail. 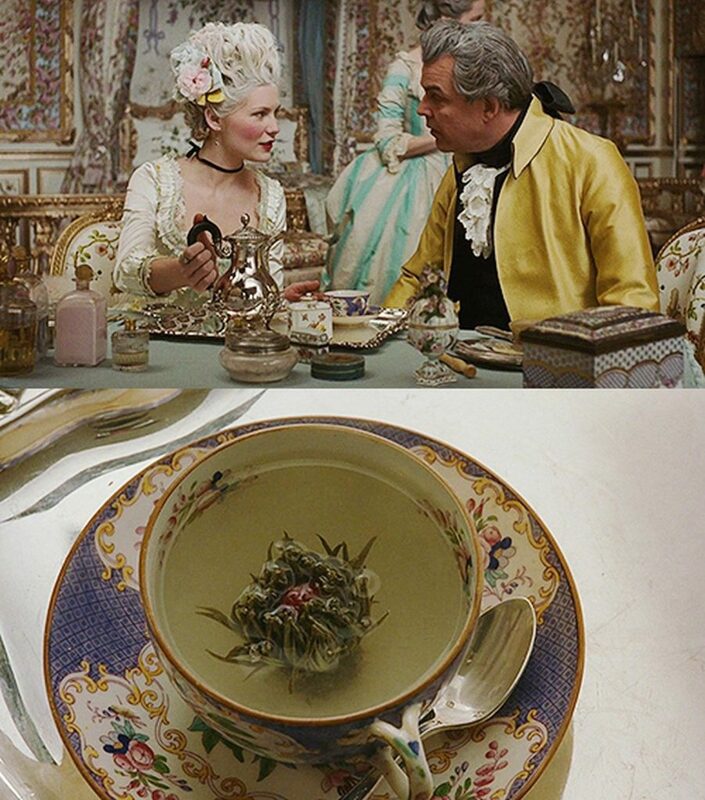 The most visually stunning portrayal of tea time on screen, however, is in Sofia Coppola’s Marie Antoinette (2006). It features Queen Marie, played by Kirsten Dunst, pouring jasmine tea from a beautiful silver tea pot for a guest of the palace. The scene shows both the Queen and the guest marveling as a flower in the tea cup blooms as the hot tea is poured over it. Whether used for comic relief or the setting for an emotional scene, there is a reason that tea has featured so prominently on the silver screen, and continues to do so – tea features in the everyday lives of millions around the world, and is a source of much joy and comfort.